Having reportedly worked out the kinks in the J-20’s engine, China is said to be ready to begin mass production of the stealth fighter. The J-20 engine’s improved power train will enable the Chinese jet to fly undetected at supersonic speeds comparable with the U.S. F-35, the South China Morning Post reported on Sept. 5, citing military sources. The J-20’s WS-15 engine has been in development for several years but Chinese technicians have struggled to get it into mass production. The engine problems – which largely related to blades overheating at top speeds – have mostly been solved in ground tests and trial flights, the report said. Twelve F-35s arrived at the U.S. Air Force’s Kadena Air Base in Japan in November 2017, while South Korea said it planned to take delivery of 40 of the stealth fighters this year. China currently has about 20 J-20s. 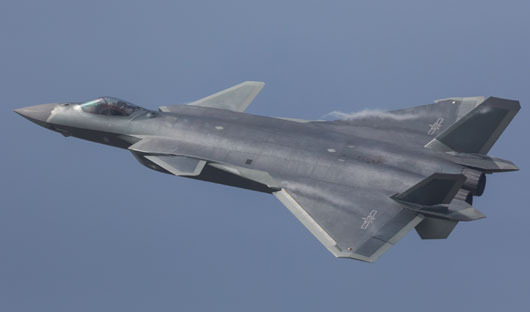 The People’s Liberation Army (PLA) said that the J-20 entered combat service on Feb. 9 of this year, although the South China Morning Post reported that the fighter jet was deployed with a “stopgap” engine. State broadcaster China Central Television (CCTV) reported that Chengdu Aerospace Corporation, which manufactures the J-20, is set to open a fourth production line for the stealth fighter in 2019.